"Loaded with fresh fruit and fruit spread, these whole grain and chia seed parfaits with creamy Greek yogurt make delicious snacks or desserts." Combine fruit spread and chia seeds in medium bowl. Stir in berries and quinoa. Combine yogurt and lemon peel in small bowl. Divide half of quinoa mixture evenly into 4 parfait glasses. Reserve 2 tablespoons yogurt for garnish. Top quinoa mixture with 1/3 cup yogurt. Divide and spoon remaining quinoa mixture over yogurt. Top with dollop of yogurt and lemon slice. Chill. 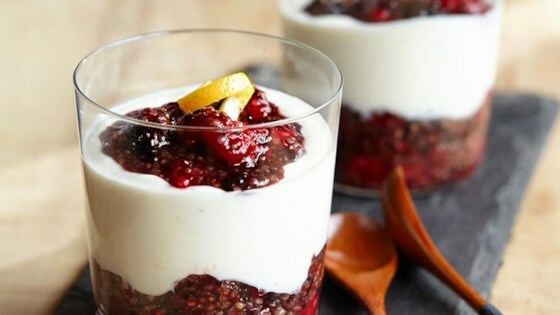 Treat yourself to a Blackberry Pomegranate Quinoa Parfait. The lemon zest is important to this so don't skip it. It was so delicious. I am saving this recipe.